This news item was posted in D, Fever category and has 0 Comments so far. Dengue is an acute, febrile infectious disease caused by a virus of Flaviridae family and is transmitted through the mosquito Aedes aegypti. Currently, dengue fever is considered a major public health problems world wide. * Dengue [DEN-ghee] is a flu-like viral disease spread by the bite of infected mosquitoes. Dengue hemorrhagic fever is a severe, often fatal, complication of dengue. * Dengue occurs in most tropical areas of the world. Most U.S. cases occur in travelers returning from abroad, but the dengue risk is increasing for persons living along the Texas-Mexico border and in other parts of the southern United States. * There is no specific treatment for dengue. * Prevention centers on avoiding mosquito bites in areas where dengue occurs or might occur and eliminating breeding sites. What is dengue fever? What is dengue hemorrhagic fever? Dengue fever is a flu-like illness spread by the bite of an infected mosquito. Dengue hemorrhagic fever is a severe, often fatal, complication of dengue fever. What is the infectious agent that causes dengue? Dengue and dengue hemorrhagic fever are caused by any of the dengue family of viruses. Infection with one virus does not protect a person against infection with another. 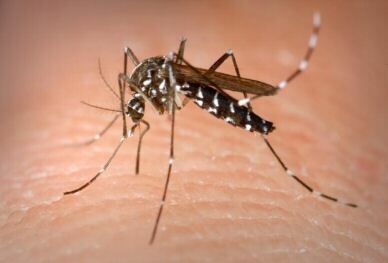 Dengue is spread by the bite of an Aedes mosquito. The mosquito transmits the disease by biting an infected person and then biting someone else. Dengue viruses occur in most tropical areas of the world. Dengue is common in Africa, Asia, the Pacific, Australia, and the Americas. It is widespread in the Caribbean basin. Dengue is most common in cities but can be found in rural areas. It is rarely found in mountainous areas above 4,000 feet. The mosquitoes that transmit dengue live among humans and breed in discarded tires, flower pots, old oil drums, and water storage containers close to human dwellings. Unlike the mosquitoes that cause malaria, dengue mosquitoes bite during the day. What are the signs and symptoms of dengue fever and dengue hemorrhagic fever? Dengue fever usually starts suddenly with a high fever, rash, severe headache, pain behind the eyes, and muscle and joint pain. The severity of the joint pain has given dengue the name “breakbone fever.” Nausea, vomiting, and loss of appetite are common. A rash usually appears 3 to 4 days after the start of the fever. The illness can last up to 10 days, but complete recovery can take as long as a month. Older children and adults are usually sicker than young children. Most dengue infections result in relatively mild illness, but some can progress to dengue hemorrhagic fever. With dengue hemorrhagic fever, the blood vessels start to leak and cause bleeding from the nose, mouth, and gums. Bruising can be a sign of bleeding inside the body. Without prompt treatment, the blood vessels can collapse, causing shock (dengue shock syndrome). Dengue hemorrhagic fever is fatal in about 5 percent of cases, mostly among children and young adults. Dengue is diagnosed by a blood test. Who is at risk for dengue? Anyone who is bitten by an infected mosquito can get dengue fever. Risk factors for dengue hemorrhagic fever include a person’s age and immune status, as well as the type of infecting virus. Persons who were previously infected with one or more types of dengue virus are thought to be at greater risk for developing dengue hemorrhagic fever if infected again. What is the treatment for dengue and dengue hemorrhagic fever? There is no specific treatment for dengue. Persons with dengue fever should rest and drink plenty of fluids. They should be kept away from mosquitoes for the protection of others. Dengue hemorrhagic fever is treated by replacing lost fluids. Some patients need transfusions to control bleeding. In tropical countries around the world, dengue is one of the most common viral diseases spread to humans by mosquitoes. Tens of millions of cases of dengue fever and up to hundreds of thousands of cases of dengue hemorrhagic fever occur each year. In the United States, approximately 100 cases of dengue are reported each year in travelers returning from tropical areas. Many more cases probably go unreported. A few persons have become infected with dengue while living in the United States. Aedes mosquitoes are found in Texas, Florida, and other southern states, and locally acquired dengue has been reported three times since 1980 in southern Texas. Is dengue an emerging infectious disease? Yes. All types of dengue virus are re-emerging worldwide and causing larger and more frequent epidemics, especially in cities in the tropics. The emergence of dengue as a major public health problem has been most dramatic in the western hemisphere. Dengue fever has reached epidemic levels in Central America and is threatening the United States. * No effective mosquito control efforts are underway in most countries with dengue. * Public health systems to detect and control epidemics are deteriorating around the world. * Rapid growth of cities in tropical countries has led to overcrowding, urban decay, and substandard sanitation, allowing more mosquitoes to live closer to more people. * The increase in non-biodegradable plastic packaging and discarded tires is creating new breeding sites for mosquitoes. * Increased jet air travel is helping people infected with dengue viruses to move easily from city to city. Dengue hemorrhagic fever is also on the rise. Persons who have been infected with one or more forms of dengue virus are at greater risk for the more severe disease. With the increase in all types of virus, the occurrence of dengue hemorrhagic fever becomes more likely. There is no vaccine to prevent dengue. Prevention centers on avoiding mosquito bites when traveling to areas where dengue occurs and when in U.S. areas, especially along the Texas-Mexico border, where dengue might occur. Eliminating mosquito breeding sites in these areas is another key prevention measure. * Use mosquito repellents on skin and clothing. * When outdoors during times that mosquitoes are biting, wear long-sleeved shirts and long pants tucked into socks. * Avoid heavily populated residential areas. * When indoors, stay in air-conditioned or screened areas. Use bednets if sleeping areas are not screened or air-conditioned. * If you have symptoms of dengue, report your travel history to your doctor. * Eliminate mosquito breeding sites around homes. Discard items that can collect rain or run-off water, especially old tires. * Regularly change the water in outdoor bird baths and pet and animal water containers.